So things are not really what I expected them to be right now. But I am doing just fine anyway. I’ve discovered a few things over the last couple of months. 1. Facebook is not necessary to my survival and I am far more productive and at peace with the world without checking it every 15 minutes. 2. I love the library! And not just for free wifi. I miss my shelves full of books. And quiet is my middle name. 5. Digital crafting is awesome! A couple of weeks ago I stumbled onto Craft Artist Pro 2 software by Serif. It took me half the afternoon at the library to download it. I played with it all that night and by morning I was totally hooked! Since then I have been downloading all kinds of free goodies every time I go to town. It’s like Christmas! I am a happy, happy girl! While I am not ready to give up on crafting the old fashioned way, there are a lot of things I really like about using digital products, especially when it comes to designing. I have really bad ideas sometimes. For every project I make, there are probably 2 or 3 that end up in the trash. It takes a lot of time to stitch and cut and do intricate work, only to find that my “amazing” idea looks like a hot mess in reality. It’s much easier and less costly to take an idea and tweak it to perfection on the computer before I attempt it in real life. It also helps me develop a better eye for what works. I am not a professional designer and I have much to learn about composition, color palettes, and style. I am also very hands-on, so just reading about it in a book does not stick in my brain. With digital products I can freely experiment with all kinds of color combinations, patterns, and embellishments and be a lot more adventurous than I would be if I were using real supplies that cost real money. 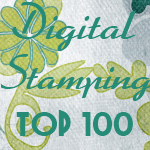 Digital papers are also printable so if I find something that looks good with my colored stamp images on the screen, it will also going to look good together when I print it out. I am very excited to try some hybrid projects involving digital and traditional media when I am able to get out my crafty mess again. And last, but not least, it gives me a way to FINALLY get all those ideas out of my head and onto my blog at last! I have been experimenting a lot lately with the light line images. I do all my coloring digitally for now so the process is a little different than using traditional media. However, I still love the softer look. Both images were colored with an android app called Layer Paint HD. The cards were both designed in Craft Artist Pro 2. It is a lot more time consuming for me to color things this way but the good news is, when it’s digital, I can use the colored image again and again. 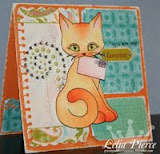 The paper and embellishments are from Pixel Scrapper. The ribbon is from Pixel Scrapper. Just in case you missed it in Ruby's post earlier this week we have a coupon code ( KRAAFT )for 20% off everything in my store through the month of June. Big THANK YOU to Heather over at Kraaft It LIVE for using my images on her show! Check it out on YouTube if you missed the live show. That’s all for now. Hope you are all having a great weekend!